Reflex sympathetic dystrophy (RSD) is a condition that is often described under various synonyms that point to its incompletely understood etiology. In 1864, Weir Mitchell coined the term causalgia to designate severe pain following nerve injury. In 1900, Sudeck described regional demineralization accompanying posttraumatic pain. In 1923, Leriche described vasomotor disequilibrium. In 1947, Evans introduced the term reflex sympathetic dystrophy. In 1993, the International Association for the Study of Pain renamed algodystrophy complex regional pain syndrome (CRPS; also known as chronic regional pain syndrome). RSD is type 1 CRPS. It can be considered an excessive sympathetic reaction of joints and periarticular soft tissues to any insult, traumatic or unknown. This is quite different from causalgia (type 2 CRPS), in which the etiology is a partial nerve injury. Because pathognomonic criteria are lacking for RSD, a taxonomic system based on clear definitions and objective quantification is desirable. Therefore, the current terminology of CRPS is increasingly being used as an umbrella to replace the myriad empirical descriptions used previously. No apparent relation exists between the degree of initial trauma and the severity of RSD, but RSD generally is more frequent following minor trauma or operations. RSD usually follows minor trauma or surgery. It also has been associated with various clinical conditions (eg, diabetes, parkinsonism). It begins with spontaneous pain associated with vasomotor and sudomotor disturbances. Iatrogenic causes of RSD following surgery, such as carpal tunnel decompression or Dupuytren release, can be diagnosed easily. No clear etiology (including trauma) can be identified in 25-35% of cases. A detailed history can be useful to pinpoint uncommon causes of RSD. 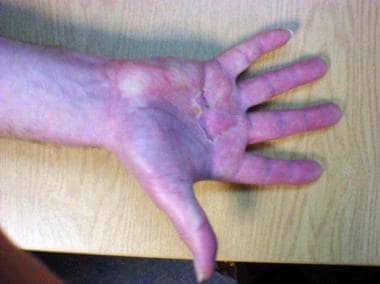 Reflex sympathetic dystrophy following surgery for Dupuytren contracture. According to various researchers, the incidence of RSD may be 2-17% following minor trauma or surgery. If causalgia is included in the broad definition, the incidence can be as high as 32-35%. In the past, many subtle forms of RSD were missed, but with increased awareness of the condition, actual incidence may be much higher than initially thought. Worldwide, no regions or population groups have been demonstrated to have a predilection for RSD. Most patients with RSD are aged 30-55 years; the mean age is 45 years. With increasing awareness, RSD is being diagnosed in children more often; however, no studies exist pointing to a particular age distribution. No particular race has a predilection for RSD. Mortality associated with RSD is negligible, though morbidity is extremely high. About 80% of patients with RSD diagnosed within 1 year of injury improve significantly. However, 50% of patients with untreated symptoms lasting more than 1 year have profound residual impairment. Emphasize to all patients the importance of early and supervised mobilization of the affected part. Give patients a list of plaster instructions and a list of realistic goals to be achieved within a specified time interval. Any lag in achieving these objectives due to pain, swelling, or other causes should inspire concern leading to early diagnosis and institution of treatment. Naleschinski D, Baron R. Complex regional pain syndrome type I: neuropathic or not?. Curr Pain Headache Rep. 2010 Jun. 14 (3):196-202. [Medline]. Koman LA, Smith BP, Smith TL. A practical guide for complex regional pain syndrome in the acute stage and late stage. Wolfe SW, Hotchkiss RN, Pederson WC, Kozin SH, Cohen MS, eds. Green's Operative Hand Surgery. 7th ed. Philadelphia: Elsevier; 2017. Vol 2: 1797-827. Ficat CCF, ed. Reflex Sympathetic Dystrophy (Bailliere's Clinical Orthopaedics). Philadelphia: WB Saunders; 1996. Bonica JJ, ed. The Management of Pain. 2nd ed. Philadelphia: Lea & Febiger; 1990. 220-43. Ackerman WE 3rd, Ahmad M. Recurrent postoperative CRPS I in patients with abnormal preoperative sympathetic function. J Hand Surg Am. 2008 Feb. 33 (2):217-22. [Medline]. Herlyn P, Müller-Hilke B, Wendt M, Hecker M, Mittlmeier T, Gradl G. Frequencies of polymorphisms in cytokines, neurotransmitters and adrenergic receptors in patients with complex regional pain syndrome type I after distal radial fracture. Clin J Pain. 2010 Mar-Apr. 26(3):175-81. [Medline]. Bernateck M, Karst M, Gratz KF, Meyer GJ, Fischer MJ, Knapp WH, et al. The first scintigraphic detection of tumor necrosis factor-alpha in patients with complex regional pain syndrome type 1. Anesth Analg. 2010 Jan. 110(1):211-5. [Medline]. Wesseldijk F, Fekkes D, Huygen FJ, Bogaerts-Taal E, Zijlstra FJ. Increased plasma serotonin in complex regional pain syndrome type 1. Anesth Analg. 2008 Jun. 106(6):1862-7. [Medline]. Higashimoto T, Baldwin EE, Gold JI, Boles RG. Reflex sympathetic dystrophy: complex regional pain syndrome type I in children with mitochondrial disease and maternal inheritance. Arch Dis Child. 2008 May. 93(5):390-7. [Medline]. Wilder RT, Berde CB, Wolohan M, et al. Reflex sympathetic dystrophy in children. Clinical characteristics and follow-up of seventy patients. J Bone Joint Surg Am. 1992 Jul. 74(6):910-9. [Medline]. Allen G, Galer BS, Schwartz L. Epidemiology of complex regional pain syndrome: a retrospective chart review of 134 patients. Pain. 1999 Apr. 80(3):539-44. [Medline]. GalveVilla M, Rittig-Rasmussen B, Moeller Schear Mikkelsen L, Groendahl Poulsen A. Complex regional pain syndrome. Man Ther. 2016 Dec. 26:223-230. [Medline]. Genant HK, Kozin F, Bekerman C, et al. The reflex sympathetic dystrophy syndrome. A comprehensive analysis using fine-detail radiography, photon absorptiometry, and bone and joint scintigraphy. Radiology. 1975 Oct. 117(1):21-32. [Medline]. Gellman H. Reflex sympathetic dystrophy: alternative modalities for pain management. Instr Course Lect. 2000. 49:549-57. [Medline]. van Laere M, Claessens M. The treatment of reflex sympathetic dystrophy syndrome: current concepts. Acta Orthop Belg. 1992. 58 Suppl 1:259-61. [Medline]. Albazaz R, Wong YT, Homer-Vanniasinkam S. Complex regional pain syndrome: a review. Ann Vasc Surg. 2008 Mar. 22(2):297-306. [Medline]. Birch R. Pain. Surgical Disorders of the Peripheral Nerves. 2nd ed. London: Springer; 2011. 534-7. Gatti D, Rossini M, Adami S. Management of patients with complex regional pain syndrome type I. Osteoporos Int. 2016 Aug. 27 (8):2423-31. [Medline]. Smart KM, Wand BM, O'Connell NE. Physiotherapy for pain and disability in adults with complex regional pain syndrome (CRPS) types I and II. Cochrane Database Syst Rev. 2016 Feb 24. 2:CD010853. [Medline]. Zollinger PE, Tuinebreijer WE, Breederveld RS, Kreis RW. Can vitamin C prevent complex regional pain syndrome in patients with wrist fractures? A randomized, controlled, multicenter dose-response study. J Bone Joint Surg Am. July 2007. 89(7):1424-31. [Medline]. Inchiosa MA Jr, Kizelshteyn G. Treatment of complex regional pain syndrome type I with oral phenoxybenzamine: rationale and case reports. Pain Pract. 2008 Mar-Apr. 8(2):125-32. [Medline]. van Eijs F, Geurts J, van Kleef M, Faber CG, Perez RS, Kessels AG, et al. Predictors of pain relieving response to sympathetic blockade in complex regional pain syndrome type 1. Anesthesiology. 2012 Jan. 116(1):113-21. [Medline]. Ek JW, van Gijn JC, Samwel H, van Egmond J, Klomp FP, van Dongen RT. Pain exposure physical therapy may be a safe and effective treatment for longstanding complex regional pain syndrome type 1: a case series. Clin Rehabil. 2009 Dec. 23(12):1059-66. [Medline]. McCabe CS, Haigh RC, Ring EF, Halligan PW, Wall PD, Blake DR. A controlled pilot study of the utility of mirror visual feedback in the treatment of complex regional pain syndrome (type 1). Rheumatology (Oxford). 2003 Jan. 42 (1):97-101. [Medline]. Radiograph of affected extremity, depicting regional osteopenia contrasted with normal radiographic appearance of the opposite extremity.